DESTINATION: FAIRMONT MAYAKOBA GIVEAWAY, QUESTION #4! Although the beautiful backdrop lures honeymooners and couples, Fairmont Mayakoba is also a heaven for wee travelers. What’s the name of Stephanie’s pint size travel companion and the name of the club for children at Fairmont Mayakoba? What activities did the pint size traveler participate in while at this club and what stylish accessories did she make for mom? You’ll have until Monday, January 30th at 9 p.m. EST to post your answer. And please don’t forget to like Stephanie Johnson and Fairmont Mayakoba‘s Facebook pages! Buena Suerte! *Please note, you don’t have to answer every week as one entry is enough to win the grand prize of a 3 night stay at Fairmont Mayakoba. A winner of the Stephanie Johnson Riviera Maya collection is announced every week, and the grand prize winner will be announced at the end of week #5! Erela is as pretty as her mama and apparently shares the same creative talent! While at the Children’s Adventure Club, she decorated a chef’s hat, made some cookies, and designed a basket to carry them back to the room. She also fashioned a colorful beaded necklace for mom which no doubt made a safe return to the states packed away in a stylish SJ travel bag! Erela is learning early on that girls’ weekends away can be so much fun! It sounds like lucky little miss Erela had a blast at The Children’s Adventure Club. She made herself a chef’s hat and some cookies, and it looks like mama is wearing the lovely beaded necklace made by Erela. I hope I win the contest because that place looks great! The name of Stephanie’s darling mini travel companion is Erela who had a blast at The Children’s Adventure Club. Her favorite activities on the trip (aside from hangin and dining with mom) included decorating a chef’s hat, making cookies and a designing her very own stylish basket. She also created a bracelet and necklace for her adoring mom who wore it every day! Bet she cant wait for her next little adventure! Sweet Erela enjoyed decorating chef’s hats and then made cookies. Your crafty little one made and decorated a basket, she made herself a bracelet and a necklace for mama, with colorful beads. You’ve got a designer in the making, my friend! Like mother, like daughter. Erela can’t help but have a keen fashion sense at her early age. At the Children’s Club, Erela decorated chef’s hats and then made cookies. She made and decorated a basket, made herself a bracelet and for her mama, she made a bead necklace. Erela is her name and she enjoys making fub and fabulous bags, cookies, necklaces and other items of bling. Erela is the pint size companion( and the cutest one at that)!! The kids club there is called the Discovery and Adventure club and made mama a necklace! visited the Discovery Club, a kids adventure thirst quencher. How about eating them while making jewelry? I response to question #4, Stephanie’s adorable pint size travel companion was her daughter Erela. She participated in activities at the Children’s Adventure Club which included a Chef’s experience where they decorated Chef’s hats and made cookies, and decorated a basket to carry them home! Pint size made a beautiful bracelet and necklace for Mama with colorful beads which she wore every day! Sounds like a wonderful Mother ~ daughter experience that will be hard to top! Stephanie Johnson’s travel companion to the Fairmont Mayakoba was none other than her three-year-old daughter Erela. It sounded like Erela had as grand of a time as her mother at the resort, taking in the Children’s Adventure Club where she got to have a chef experience one day, making cookies and decorating chefs’ hats, and making a bracelet on another day. She even made her mother a necklace of colorful beads, perfect to wear at beach or maybe to wear to one of the resorts many restaurants. Sounds like Erela enjoyed the amenities at the Fairmont Mayakoba too. Although what little girl wouldn’t love a bath filled with rose petals? And she was even so taken with the french press, she had her mother making fresh coffee every morning, even though Stephanie is not a coffee lover. Sounds like the perfect trip for girls of all ages! I can’t actually tell whether your daughter’s name is Erda or Erela due to the font on the photo… she enjoyed the Children’s Adventure Club, where she decorated chef’s hats and then made cookies, as well as a basket to tote them back to the casita. She also made a colorful bead necklace for her mama! Such amazing memories you are creating with your daughter Erela! What three year old wouldn’t enjoy spending time at the Children’s Adventure Club!? (Although counting iguanas on your walks and bathing in a sunken tub filled with rose petals was probably also high on her list! ) Erela had a chef’s experience decorating chef’s hats–and then topped it off by making cookies. She even got to make and decorate a basket to take her yummy cookies back to the casita. (perhaps to enjoy with the french press coffee???) Her adventures weren’t over however. Another trip to the Children’s Adventure Club offered the experience of creating a bracelet for herself, and a necklace of colorful beads for mom. And what mom wouldn’t treasure her handmade gift from a special little girl–and wear it every day on vacation! A wonderful souvenir to recall a special getaway with Erela at the beautiful Fairmont Mayakoba Riviera Maya. Kate, you’re our week #4 winner! Congratulations! Please email sarah@stephaniejohnson.com with your mailing address so we can send your prize! The adorable Erela is the pint size companion….The kids club is called the Discovery and Adventure club and Erela made her mother a bead necklace! SJ could relax on the beach with peace of mind knowing her pint size travel companion was well taken care of at the The Children’s Adventure Club. SJ’s very adorable daughter with a name to match, Erela was not just cared after but expanded her growing mind with a chef experience class including decorating a chef’s hat and making tasty cookies. She did not drop a single cookie on the way back to her casita, she simply tucked them into her self decorated basket tote. But Erela being the mini style icon to her mother, she did not forget to let her mother know she was thinking about her signing her a custom made colorfully beaded necklace that SJ wore the rest of the trip. Oh and don’t worry Erela made herself a cute bracelet to accessorize herself for her lavish beach vacation. Mother and Daughter stepped out in style as the biked around the resort. Stephanie’s daughter’s name is Erela. The “tiny one” enjoyed arriving to a bath tub filled with flowers. I’m guessing that’s part of where she probably drew her creative spark in the Children’s Adventure Club. I can only the imagine the colors that were seeping into her mind when she decorated her basket and chef’s hat during her her experience with the chef baking cookies. She was able to further her creative genius by making a necklace and bracelet for her mama Stephanie who wore them proudly during their trip. 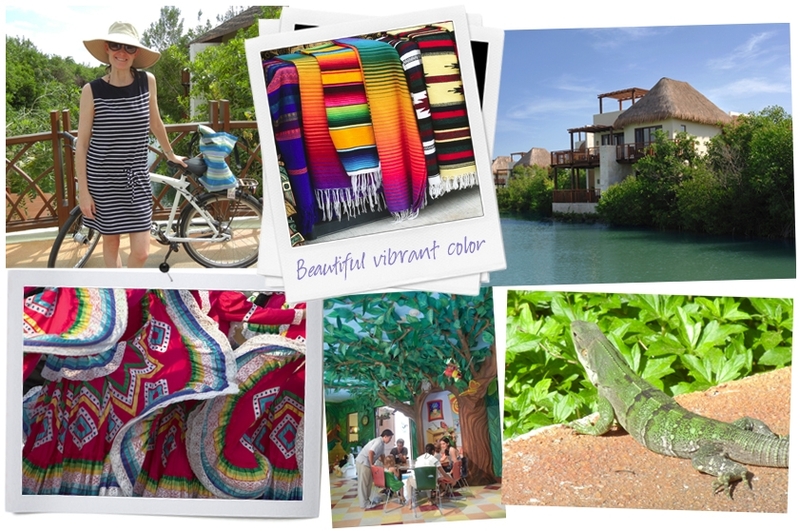 Where these colors from the flowers and surrounding textiles at the hotel the inspiration for the Riviera Maya collection? I’d like to think that a child’s imagination could lead to such vibrant color choices in Stephanie’s line. Like mother, like daughter! The most precious Erela is the pint size travel companion of Stephanie. Erela spent her time at The Children’s Adventure Club, she decorated a chef’s hat, made cookies, and designed a beautiful basket to carry them back to the hotel room. She also designed a one of a kind colorful beaded necklace for mom and a wonderful bracelet for herself!! Sweet Erela had a fabulous Chef’s experience of baking cookies and decorating hats and baskets at the Children’s Adventure Club! Erela also learned the art of jewelry making at the club and made a beaded necklace for her mama! What an adventure she had! !